This week Colonel Light writes in his diary while sitting in his hut and we hear that his men are building a store-hut nearby using building materials unloaded from the Rapid. He has divided his surveyors into two groups and has sent them to different parts of South Australia in his quest to find the best site for a capital city. As he sits in his hut swatting flies we wonder what his hut is like and this gives us an opportunity to look at the homes that were built in South Australia in 1836. How were these early homes built? What were they made from and what factors influenced the types of homes people built? What would the hut that Colonel Light lives be like? 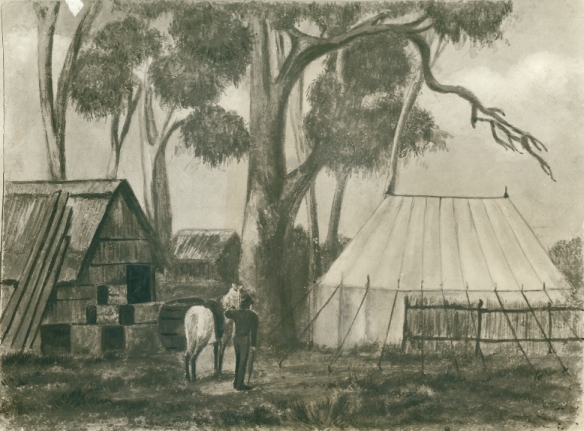 What types of houses were built when the people from our voyages arrived in South Australia? How were decisions made about where to build houses and what designs to use? What building materials were available to use at this time? How did Aboriginal people build homes and shelters at this time? How did these homes vary depending on the climate and environment? How have Australians adapted their homes to the areas they live in? For example: underground dug outs in Coober Pedy, houses on stilts in Queensland and high rise apartments in inner city areas. 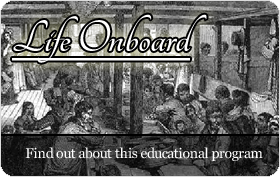 What types of homes did the people onboard live in back in England? How did social status and wealth impact on the type of homes people lived in. Many people in Australia today choose sustainable building materials and practices to build their new homes. How sustainable were the homes built in Australia in 1836? Use internet search engines to find pictures of houses from around the world. Use the information to place these pictures in chronological order. Make observations of how houses have changed or stayed the same over time. From this research make a list of words used to describe types of houses, building materials and parts of houses. Investigate any words you haven't come across before. E.g turret, transom, portico, pediment and gable. Pose inquiry questions to guide research about the houses people lived in Australia in 1836. Houses in the 19th century reflected the owner's wealth and status. Wealthy landowners built large homes with many rooms and multiple levels. Use the sources provided on the My Place website to compare the small house featured on the website with the home of wealthy landowners. Interpretation and perspectives Read through Colonel Light's journal entries this week. Imagine you are one of the surveyors being sent off to explore areas of South Australia. Write your own journal entry. Explanation and communication Choose two different people you have met on our voyages and design a home for them to live in when they arrive in South Australia. Show your designs using floor plans. Find out how architects use floor plans to communicate information to builders and customers. Look at some examples to guide your thinking. 1. Find out about the homes in your local area. Choose a street near your school and take photographs of the houses in the street (with permission if appropriate). Compare the photographs you have taken. What are the differences and similarities between the houses? Consider building materials, styles and size. How old do you think the houses are? Can you place the photographs in chronological order? Give reason why you think some houses are older than others. 2.Investigate the history of your own home. Who built your house and what is it made of? How long has your family lived there? How many other people have lived in your house? How old is your house and has it changed in anyway over time? Do you have any old photographs of your house to compare with how it looks now? What was the land like before your house was built? Did another house or building used to be on the site? 3. Visit the ABC My Place website and use the resources to think about how the history of a house can give us so much information about people's lives in the past. 4. Conduct an audit of a day in your life at home. List all furniture, equipment and appliances that you use in a typical day. Read through your list and imagine that you are living in 1836. Cross out any items that you would not have been able to use in 1836. Make a new list with items that you would have used for everyday tasks in 1836. 5. 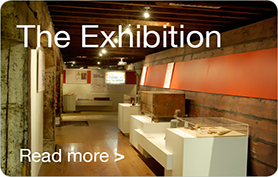 Design and build a model of a house that people might have built in 1836 in South Australia. Design a floor plan and describe the building materials that you will use. Where will these materials come from and who will build your house ? Build your house model and add furniture, fences, gardens etc. 6. Explore the history of streets in your area. How do streets get their names and have these changed over time? What do street names tell us about the history of an area? Who decides what to name streets and how do you think this would differ if somebody else made the decisions? Look at the street names in Adelaide and consider how people from our voyages influenced their names. How do you think homes in South Australia would have differed if they had to be built using only building materials available in the local area? The early settlers in 1836 wanted to build houses in South Australia that were as close as possible to their homes back in England. Join us again next week as we catch up with Colonel Light again and think about the processes he uses to explore South Australia, discover new things and make decisions about establishing the colony.